A must for local mushroom lovers, the menu of this romantic Willamette Valley spot is mushroom-centric in many tasty ways. : Portland's rainy, forested environment is a paradise for mushrooms, which is probably why the Czarnecki family, with four generations of experience as mushroom hunters and restaurateurs, chose to relocate here from Pennsylvania. 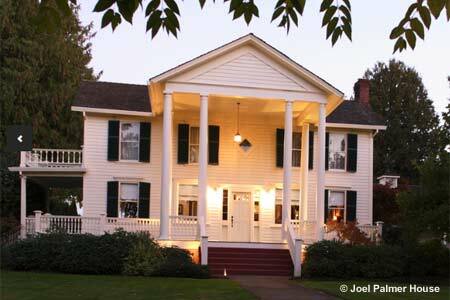 They set up shop in a gracious Victorian mansion, the historic residence of Oregon pioneer Joel Palmer. Owner/mushroom guru Jack Czarnecki gathers the wild fungi himself and knows exactly where morels, lobster mushrooms and porcinis hide. His son Chris mans the kitchen, showcasing these fungi finds. Look for dishes such as beef stroganoff, sturgeon with curried quinoa and lobster mushrooms, or elk sirloin with black trumpet mushrooms. Czarnecki's wife Heidi created a savory three-mushroom tart. Dishes change frequently as the Czarneckis enjoy experimenting with local ingredients and sharing their creations. For the ultimate experience, your table might order the Mushroom Madness Menu, an eight-course meal featuring mushrooms, even for dessert (think crème brûlée with essence of candy cap mushrooms). A vegetarian version excludes the steak and sturgeon, but offers plenty of innovative takes on mushrooms and other vegetables. If this all seems too intense, try the three-course tasting menu that still supplies plenty of inventive fungi preparations. The restaurant's wine list is one of the best anywhere for Oregon vintages, and you'll be offered expert advice choosing your selection.